US machine maker Milacron Holdings’s newest European manufacturing facility in Polička, Czech Republic, will manufacture the Uniloy brand's complete range of blow moulding machine systems. Milacron’s investment in the Polička facility represents a continued commitment and long-term strategy for the European market. Milacron will also start delivery of its extended injection product portfolio including the Magna Toggle Servo (MTS) and Elektron EVO from Polička, to support growth and customer demand as a result of the launch at Fakuma in October 2015. 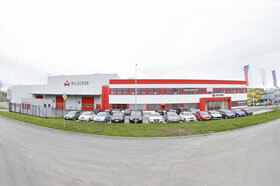 Milacron’s Polička facility opened April 2015. The facility is over 11,000 sq m, with a planned addition that will add 4,000 sq m, and skilled workforce of over 90 employees. The labour force has more than doubled since opening to meet production demands. Over the last several weeks, the Polička facility has shipped a number of blow moulding machines to customers in European countries, South America, China and the US, says the firm. In addition, Milacron continues to evaluate strategic suppliers to ensure a robust and efficient supply chain to complement the progress of the site. To date things have operated well beyond expectations and as a result have seen 100% on-time delivery of all machine orders. 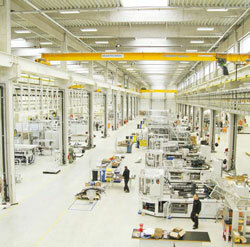 The facility represents an investment of over EUR15 million. “Our investment in Europe is imperative to support our growing global customer base. 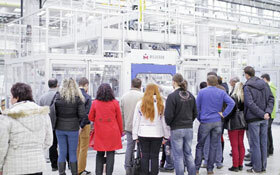 Our goal here is simple; to be the European leader in blow moulding system manufacturing,” said Ron Krisanda, CEO, Advanced Plastic Processing Technologies. Milacron’s Uniloy brand has blow moulding machine manufacturing facilities in Polička, Czech Republic, and in the US. The systems are designed and engineered in three technology centres: Berlin, (Germany), Magenta, (Italy) and Afton, Ohio (US). Uniloy’s moulds are manufactured in Tecumseh, Michigan.